Every year we turn to you, dear reader, to tell us (and your neighbors) whatâs on your mind. We ask you to tell us the best places to eat, the best bands to check out, the best shops to visit, the biggest news stories and plenty more tidbits of Chippewa Valley trivia. And every year you come out in droves to let your voices be heard in our Best Of The Chippewa Valley Reader Poll. And thatâs nothing to scoff at. This year, 4,288 of you chimed in to give us some insight on our own community. You cast just under 100,000 votes spread over 150+ categories. Thatâs a lot of opinions. And probably most amazingly is that theyâre all over the place. Some categories had scores of responses that ranged from having a couple votes to hundreds. And sure, the Best Of is a poll so we counted up votes to find the top three results of every category, but almost more interesting is the diversity of opinions represented. That to us is the most important part of this whole process: All the votes you made, all the opinions you shared are conversation starters. ... Theyâre about getting people to think about all the great things this community has to offer, or maybe the things that it doesnât offer but should. But the poll doesnât just exist to talk about the great things we already have. Some of the most conversation-worthy parts of the poll might be what isnât there. What are people looking for that they canât get here? What categories seemed like they could use some bolstering? Maybe some smart entrepreneur can find a market that hasnât been hit here. And maybe that person is you. 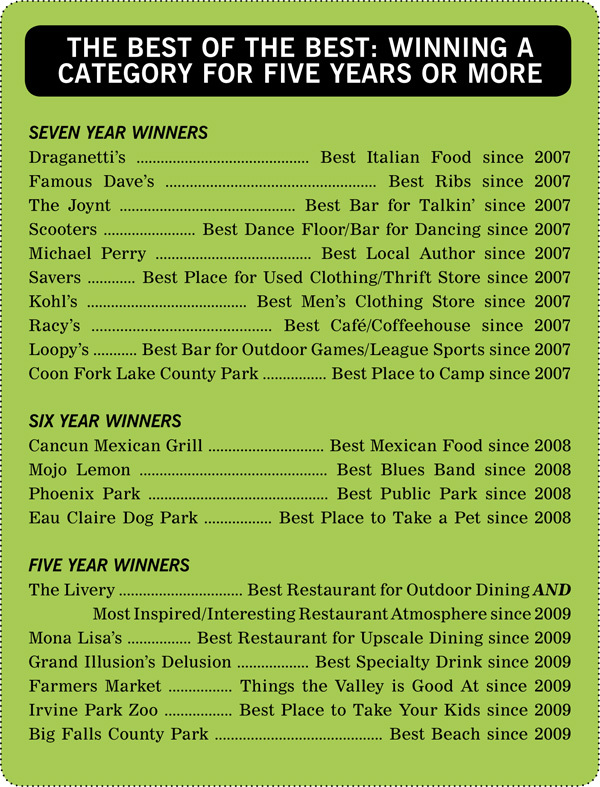 So as youâre perusing your way through the results of the 2013 Best Of The Chippewa Valley Reader Poll, the most important thing to remember is that this is yours. This poll is yours and â more importantly âÂ this community is yours. Take this as a starting point to find something new or, better yet, create something new to continue moving our community forward. Take pride in the results you love and take the results you donât agree with head on and use them both to make the Chippewa Valley a better place to live for all of us. Whoever said âYou canât win âem allâ? Not diners feasting on sumptuous Italian fare at Draganettiâs. Not the barstool philosophers conversing over a pitcher of Grain Belt in the corner booth at The Joynt. And not the late-night hordes workinâ in â and workinâ it hard â on the dance floor at Scooters. Itâs these folks â the voters in Volume Oneâs annual Best of the Chippewa Valley Poll â who ignore the old clichÃ© and year after year crown these and a handful of other establishments as the best in their fields. Dozens of winners have come and gone in our poll, now in its seventh year, but an elite group of 10 victors have led the balloting in their respective categories every single year. They may be serving lasagna or selling menâs suits, but their consistent excellence â year in and year out â has given them a string of championships that puts them on par with some of the great dynasties in sports: The Boston Celtics. The New York Yankees. The Green Bay Packers. Hot on their heels are a group of establishments that have won for the past five or six consecutive years. Some of the up-and-comers â The Livery, Phoenix Park, Cancun Mexican Grill â are likely legends in the making. To highlight these individuals, eateries, businesses, and other assorted entities (including one legendary alcoholic concoction) weâve created this hall of fame so you can bask in the glory of the Best of the Best. Illustrations: Our 2013 'Best Of' illustrations were produced by the capable hands of Luke Benson,Â a recent graduate from UWEC, where he got his BFA in, you guessed it, illustration.